What better way to hit the weekend than with news of another classic Masters of Cinema release from Eureka Entertainment? 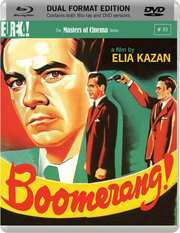 Out to buy on 19th May is Boomerang!, directed by Elia Kazan and starring Dana Andrews, Lee J. Cobb, Jane Wyatt, Arthur Kennedy and Karl Malden. This comedy crime drama comes in a dual format Blu-ray and DVD edition, presented with a black and white 1080p transfer for the HD release, in it's original 1.37:1 aspect ratio. Extras will include the obligatory 36 page booklet with essays andvintage interview material, whilst the recommended retail price will be £17.99. When the murder of a piece results in a botched police investigation, prosecutor Henry Harvey leads an effort to bring the murderer to justice. Once blackmail creeps into the investigation, all bets on an unclouded trial are off, resulting in an explosive finale that remains one of the toughest in Kazan's work. With its documentary-like treatment of the procedural, and generally authentic portrayal of an exurban Connecticut town, Kazan's film was a success at the time of its release, and garnered awards from both the New York Film Critics Circle and the National Board of review for Kazan's direction.